For Tea Time or Coffee Time! 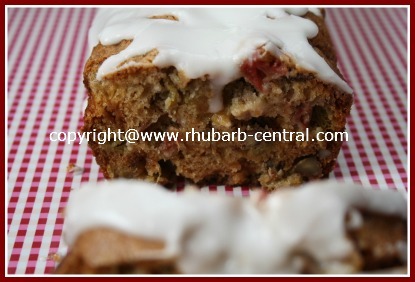 This deliciously scrumptious Rhubarb Loaf Recipe with pecans (or use the nuts of your choice!) is simple and irresistible! 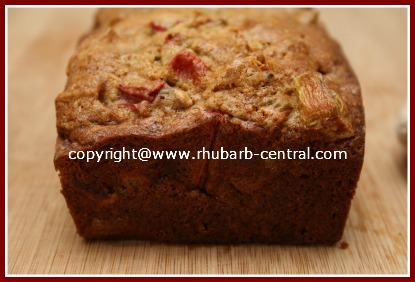 A friend gave me this fabulous, moist rhubarb recipe that can be made with fresh or frozen rhubarb. This delectable bread (made with a veggie - rhubarb is a vegetable!) is perfect on its own, or add the optional glazed topping as a special treat! 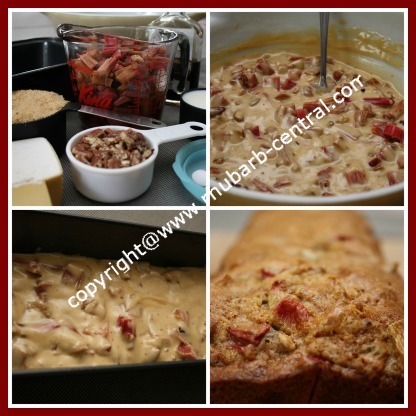 I made this recipe today, using the last of my frozen rhubarb (I had about 30 bags of rhubarb in the freezer!). I couldn't wait to post this recipe and the pictures! 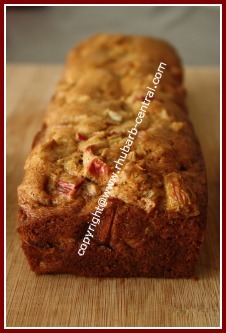 It really is a finger-licking good rhubarb bread! Note - if you are using frozen rhubarb for this recipe, thaw it over a sieve and discard the excess liquid. Be sure you have 2 cups of thawed rhubarb. (You may need to thaw a little more than 2 cups). In a medium size bowl combine the flour, baking soda and the salt. Set aside. In a large bowl, whisk the egg with the brown sugar, buttermilk, oil and vanilla. Gently stir the flour mixture into the egg mixture. Add the chopped rhubarb and the chopped pecans, stirring just until combined, do not over mix. Transfer the batter into an 8" x 4" or a 12" x 3" greased loaf pan (I used non-stick cooking spray). Bake at 350 ° F for about 60 -70 minutes for the 8" pan, and about 45 - 50 minutes for the 12" pan. Test to see if the loaf is done by inserting a toothpick into the center. If the toothpick comes out clean, then the loaf is ready. Transfer pan with bread to a rack to cool for about 10 minutes, then invert pan to remove the loaf of rhubarb bread. In a small bowl, stir the icing sugar with the lemon juice, adding the juice 1 tsp. at a time, until thick and smooth. 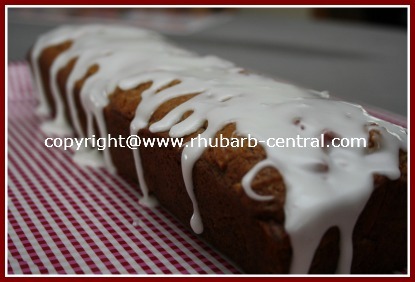 Drizzle the glaze over the warm rhubarb loaf, allowing the glaze to run down the sides.